This is how we put together our version of the Gaunt Replica Crusader. Our version of the Peter Gaunt Replica trials Crusader. 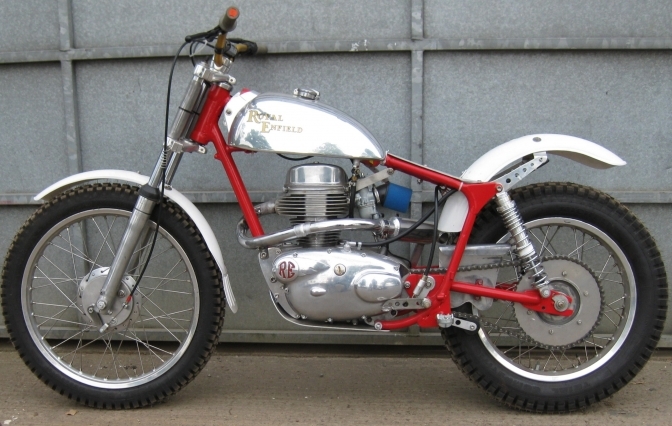 After taking a look at the workmanship of the Peter Gaunt Royal Enfield Crusader Trials bike. My Brother decided we needed to build one similar. 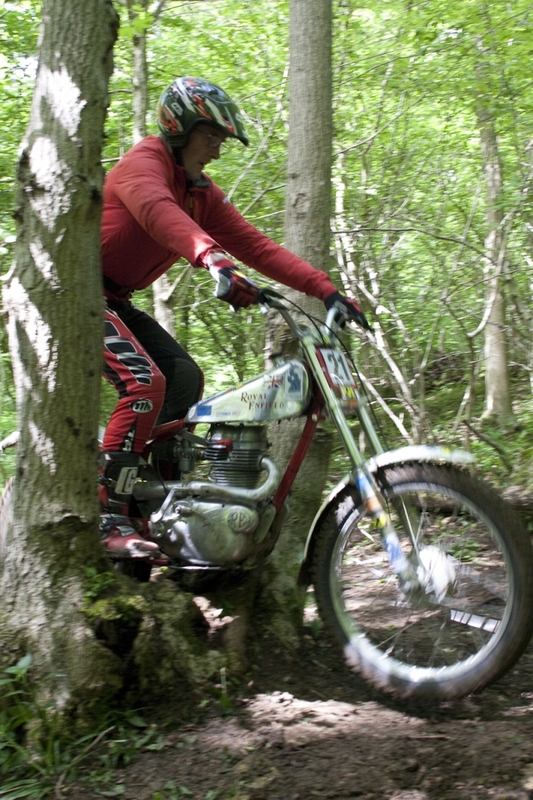 A suitable donor bike was bought from the wilds of Yorkshire; from tuning wizard Keith Horseman It had started life has a production Crusader trials,but had been used by a ex works RE trials rider, but was in a sorry state now. But came with a box of spares including a clutch and set of spare crankcases, that had been modified. With the bike striped out, and the oily engine set to one side. The steering head bracing tube needed replacing. And pictures of Peters bike were studied hard to see what needed doing for the conversion. Mainly simple, get rid of any brackets etc that were not essential and weld on new footrest positioning plates, the sub frame at the back was slimmed slightly, and tank mounting and ignition coil brackets fitted. Steering head angle was left has it was when we got the frame this had been tweaked by ex RE works rider we were told. That’s the frame and swinging arm sent off to the powder-coaters at Redditch then. We had a set of Rickman hubs and Ceriani forks taken from a Petite Metisse, so they were to be used for the bike. The wheels went off to Central Wheels for new rims to be spoked in, while I overhauled the forks. And polished the yokes and sliders. Parts needed for the engine were looked for, a splined Albion gearbox main-shaft and clutch that would fit and reduce the risk of the clutch leaving the tapered shaft like they often did. I modified the crankcases around the gearbox drive sprocket to relieve the chance of built up mud in this area, another problem that had been well documented. Brother had been sent of up the road to Hitchcock Motorcycles. to purchase an engine gasket set and new Carb. He was gone a long time even for him. Eventually he returned not only with a gasket set and Carb but also with an alloy barrel casting for a Crusader? He had bumped into Allan Hitchcock, and Allan had found a discarded alloy casting from when they had a batch cast many moons ago. The machining on the barrel had been started but was slightly wrong so the barrel had been shelved. Good luck for us though, and we have a guy that loves playing with his big lathe, so bruv was sent of to Westwood’s for a suitable liner. Paul did a grand job of fitting this liner so the barrel had been salvaged. After another trip to the Hitchcock establishment, it was suggested by the guys there that if we really wanted the best Crusader motor that could be built we should take the engine parts all that we had now sourced, to Ray Tew at Alcester. Ray was one of the last guys working in the engine development shop at Redditch, and had put together some brilliant motors. The engine went that a way, and was rebuilt like a watch, by Ray. A lot of the parts he was not satisfied with and replaced. Some parts he would not even tell what had been done to them, oil pump etc, gearing, and the head had been welded re-ported and machined for new valves of his choice. The alloy barrel was not going to be used at first, but then Ray had everything re line bored to his satisfaction before he would use any of the items, he is this much of a perfectionist. What ignition did we expect to use, he asked. I suggested Getting in touch with Electrex World as we had spoken to them at Wrighties show about a unit for a Crusader. So that’s what we got for Ray, and he manfully fitted it and timed it to perfection. So the next day I started to build the rolling chassis. Bearing and sleeves were machined up to fit the Mettise front end to the frame, but when I went to fit the back wheel into the swinging arm I had a problem, it was just not wide enough. 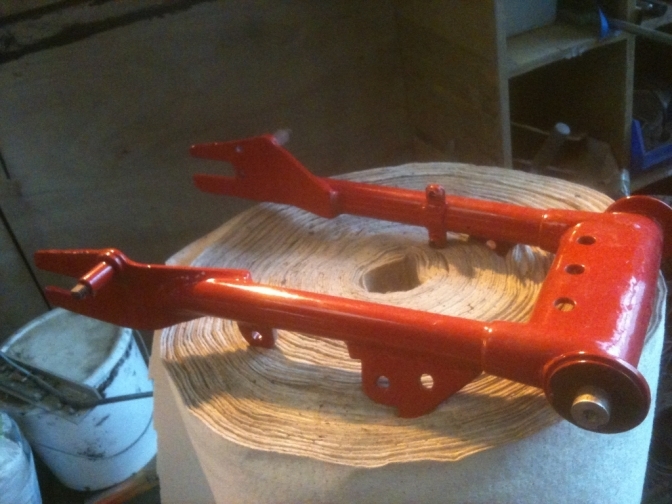 I toyed with fabricating a new one, but on doing a bit more research, it looked like the later Sports Crusader swinging arm was wider, so we started to look for one of these. Not content in doing things by halves, my brother bought a complete bike just for that arm. It was removed from the machine and rushed off to Redditch for its coat of Orange. Rockshocks had built a splendid custom pair of rear shocks for the bike and with the new wider arm installed the wheel was fitted. Paul had machined a new blank sprocket. So we were now ready for the engine. It is a rare thing you see in life, but you could just see the dedication that Ray had put into this engine build by the pristine look of the motor just from the outside. The engine fitted easily using the new Dural engine plates and guard I had made. The superb alloy fuel tank from Hitchcock’s was the crowning glory of the machine. Fuel added and one kick of the stainless starter lever that had been fitted and the motor leapt into life. And one ride around the yard, proved the workmanship that had gone into this British Classic build and how brilliant a little bike it had turned out. It could be a tiny bit too high geared, but Ray refused to alter the engine sprocket size because of reliability. This is Peters bike, so how close did we get? This bike now lives in Spain! 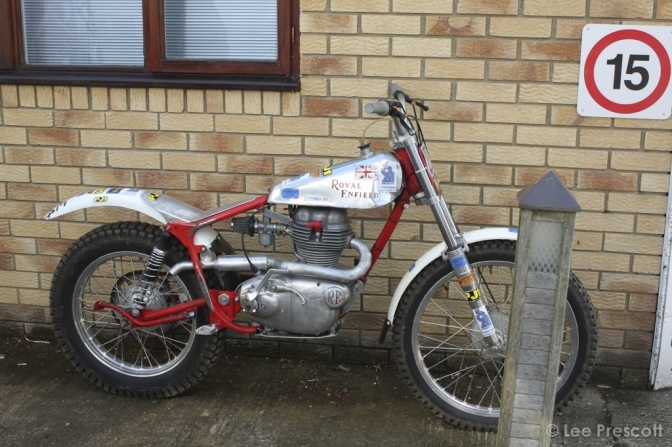 bought by a truly Classic trial enthusiast. 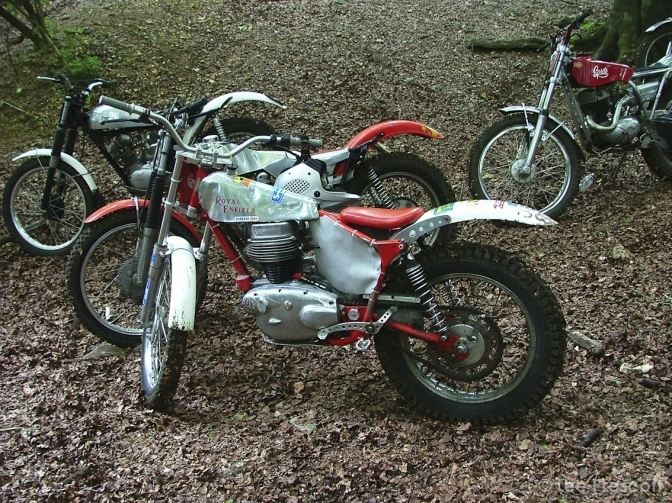 This photo of the Enfield was taken by Lee in the same Sam Cooper Union Jack Trial. but twelve months earlier, than the photo above it . Peter still has the steel barrel fitted , and the carburettor is kept secret, probably until the Villiers S22 unit was tuned for the job. Yes we have a Villiers S22 carb to try onto the engine later but Ray had tuned the Amal carb, from Hitchcocks in his usual way, to perfection, for this bike, so the carb was well and truly left on the machine. A longer exhaust was asked for so that is why our version sports the crossover pipe. ( to be revised and built using stainless or something more exotic). But do we need the Bling?? Sam used the material for his wheel spindles ETC though. This is the swinging arm that I could not use as it was just to narrow. Shame because of the work put in on this part of the build. Peter cleaning what I thing is the section named "Hanging Tree" used in the Sam Cooper trial.? This page was to be linked to ORR-e 23, but it looks like Deryk ran out of space for the article. so here it is on BSA"Otter". It is Now in ORRe 24.along with loads more superb photos.and reports. Thank's to Allan Hitchcock for the help he gave us. More later with an update.